I love meatloaf. I love cheese. I love stuffing. I love this dish. I recommend serving it with two of your favorite vegetable sides. It will feed 6-8 hungry adults. Don’t let the unorthodox spice pairings scare you, this meatloaf is loaded with flavor. 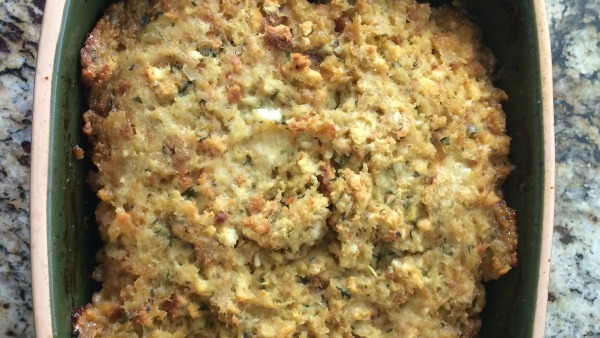 The Smoked Gouda Stuffing goes on top, and you bake it all together. 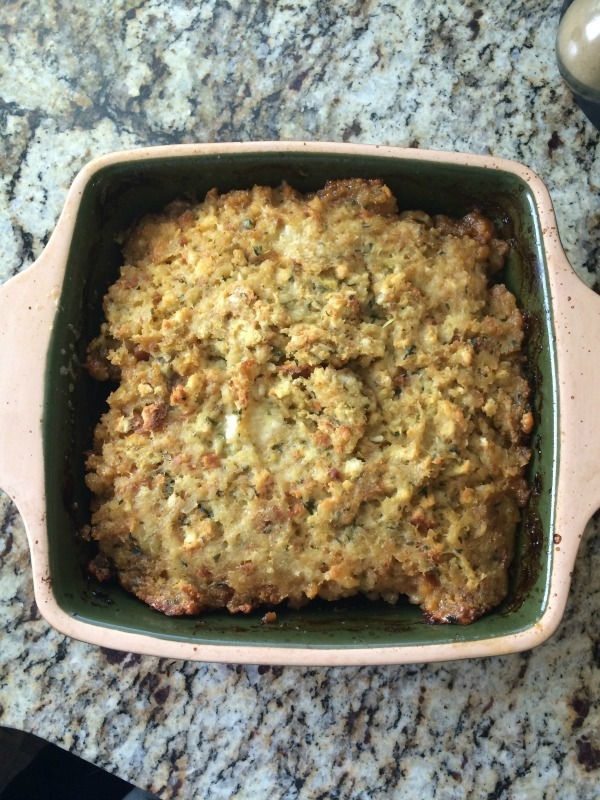 *(insert angels singing here)* Not your mother’s meatloaf, but she’ll love it too. Start with your croutons. Toss them in a food processor until they are crumbs. Poor these crumbs in a large mixing bowl. Move to the vegetables. I went with this pairing (suggested by the great Alton Brown), but there’s no reason you couldn’t try other veggies: celery, cauliflower and sweet potato all come to mind. 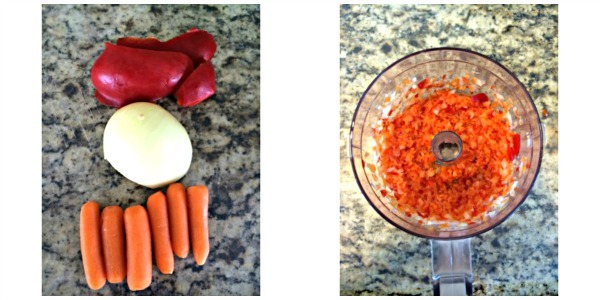 Put your veggies, and your 2 cloves of garlic into the food processor now and chop. You don’t want to grind them, but you do want them to be chopped well so they disappear into your mixture (my kids didn’t even notice!) and don’t come out crunchy. Add your veggie mixture to the mixing bowl. 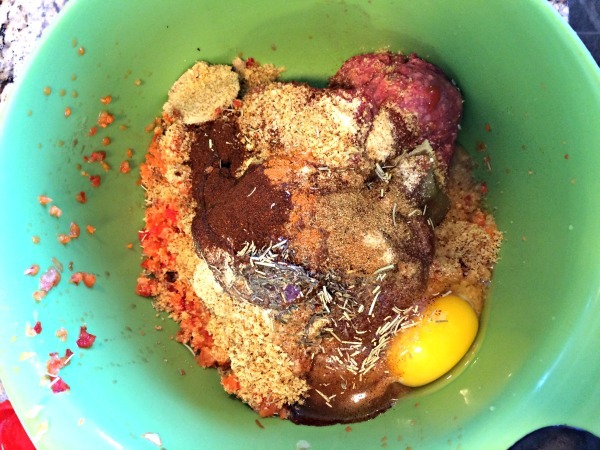 Now, add your meat and all the rest of the meatloaf ingredients to the mixing bowl as well. So pretty! Now, carefully begin combining all your ingredients. I prefer to use my hands, but a good sturdy spoon will work alright as well. Be careful not to crush your meat, or grind it between your fingers. Mix gently, but thoroughly. Now place the mixture into a 2 quart baking dish, and let it rest for a minute. Turn your attention to your stuffing. 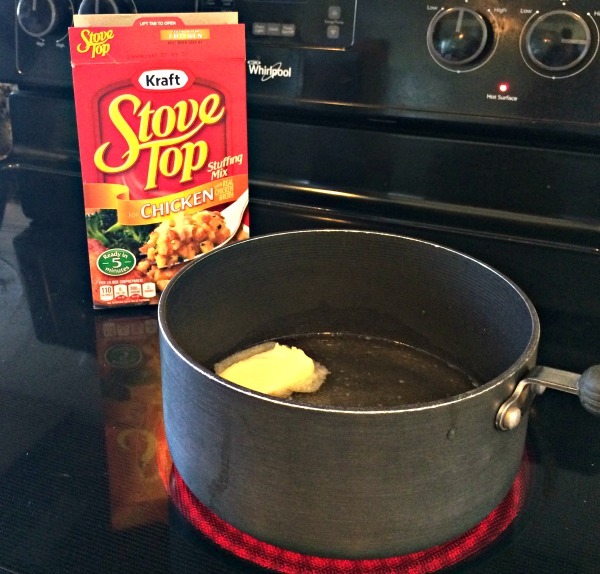 In answer to your questions: Yes, I always use StoveTop, and yes, I always use chicken flavor. 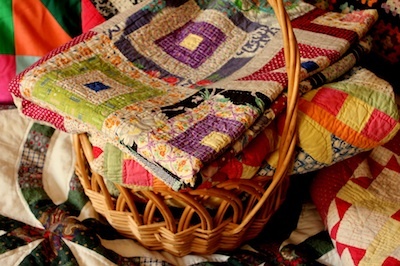 You may use whatever brand you’d like, and if you’re feeling wild and crazy go ahead and try a different flavor. Livin’ on the edge!! Prepare your stuffing according to the instructions on the box. 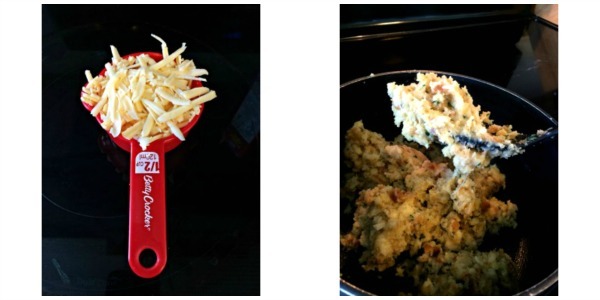 While your stuffing is still hot, add the heaping 1/2 cup of smoked gouda and mix well. MMMMM, cheesy. 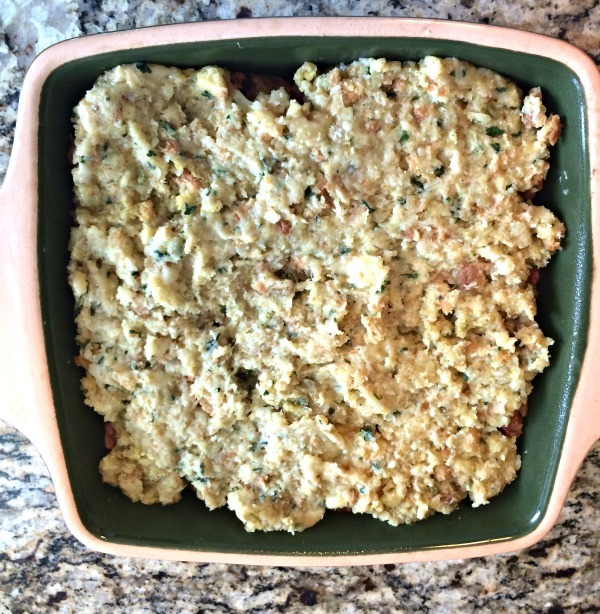 Spread the stuffing over the top of the meatloaf. At this point you can do one of two things. You can cover and refrigerate your meatloaf for a day or two (making this in advance is never a bad idea), or you can bake it immediately. I like options, options are nice. You will bake this at 350 for an hour (maybe 70 minutes if you need). You will bake it COVERED with foil for the first 25 minutes. Then remove the foil, so the stuffing can brown, for the rest of the time. After the hour test a small section in the middle to be sure the meat is cooked through. You can drain any excess grease from the baking dish before serving. 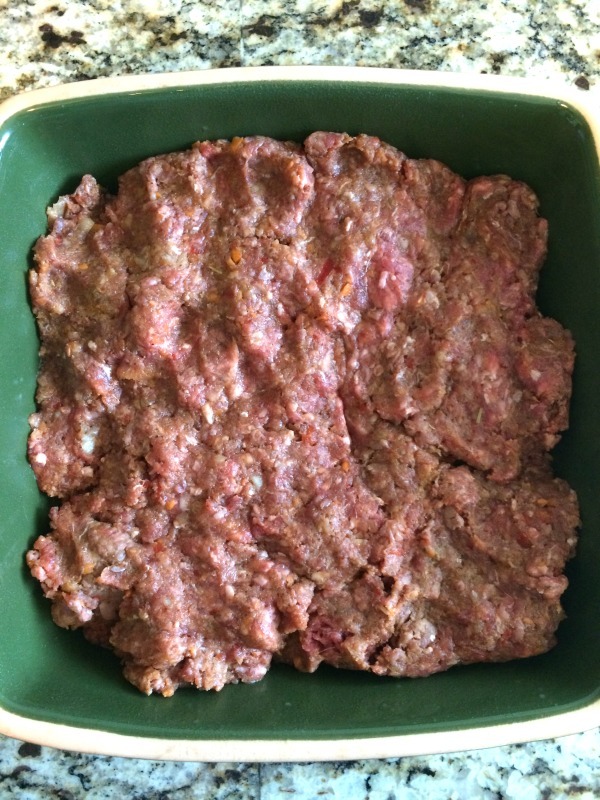 Let the meatloaf rest for about 10 minutes before slicing. ENJOY! 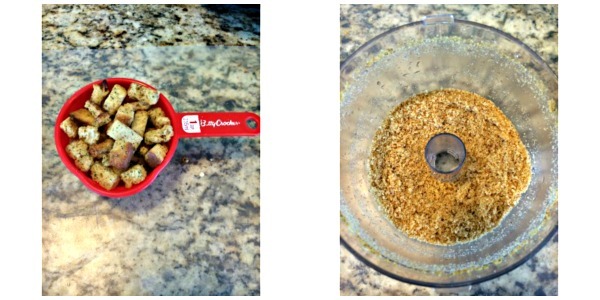 In a food processor grind the croutons into crumbs, pour into mixing bowl. In the food processor chop the veggies until very small, but not totally ground, add to bowl. 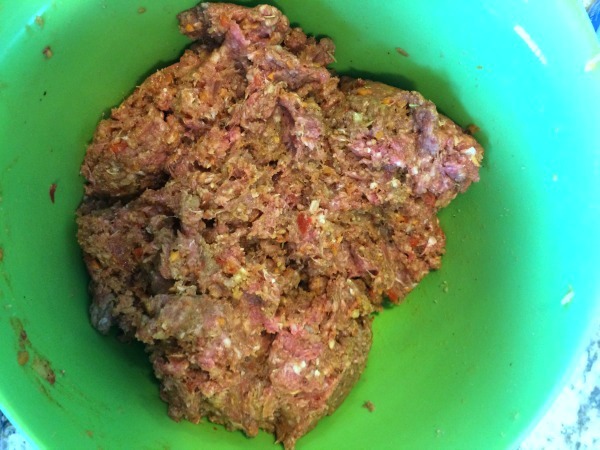 Add the rest of the meatloaf ingredients to the bowl and mix thoroughly, but gently with your hands. Pour mixture into a 2-quart baking dish. Prepare the boxed stuffing according to package instructions. While the stuffing is still hot, add the Gouda cheese and mix well. Spread the stuffing mixture over the meatloaf and COVER with tin foil. Bake for 25 minutes, then UNCOVER and continue baking for 35 more minutes. Check the center for doneness, cook for 10 more minutes, if needed. Drain excess grease from pan. Let meatloaf rest 10 minutes, then serve.